Biotechnology and its use to modify the genetic makeup of living organisms has become a topic of heated discussion in recent years. Confusion is plentiful on the topic of biotechnology and genetically modified organisms (GMOs). The purpose of this publication is to discuss genetic/biochemical processes at a basic level and how biotechnology is used to modify the genetic makeup of an organism. The complete set of genetic instructions for a living organism is contained in its genetic code, referred to as its genome. The genome for each organism differs by the number and size of chromosomes and the number of genes each contains. Each chromosome is composed of a single strand of deoxyribonucleic acid (DNA) and specialized protein molecules (Figures 1a and 1b). Coding regions called genes are along the DNA strand of each chromosome. Only specific regions of each chromosome code for genes. Alternate forms of genes in each organism account for the differences among individuals. Each DNA strand is composed of similar repeating units called nucleotides (Figure 1c). Four different nucleotide bases are present in DNA. They are adenine (A), thymine (T), cytosine (C) and guanine (G). The specific order of these bases in a gene coding region on the DNA strand specifies exact genetic instructions. Two DNA strands are held together by bonds between the bases; these constitute base pairs. Often the size of a genome is referred to by its number of base pairs. Each time a cell divides, the full genome is replicated, and each daughter cell receives an exact copy of the genetic code (Figure 1d). Each strand of DNA directs the synthesis of a complementary strand, with free nucleotides matching up with their new complementary bases on each of the strands. Strict base pairing is adhered to; A will pair only with T, and C will pair only with G. Each daughter cell receives one old and one new DNA strand (Figure 1e). Figure 1. The basic structure and function of chromosomes and genes. The genes on each DNA strand contain the basic physical and functional units of heredity. 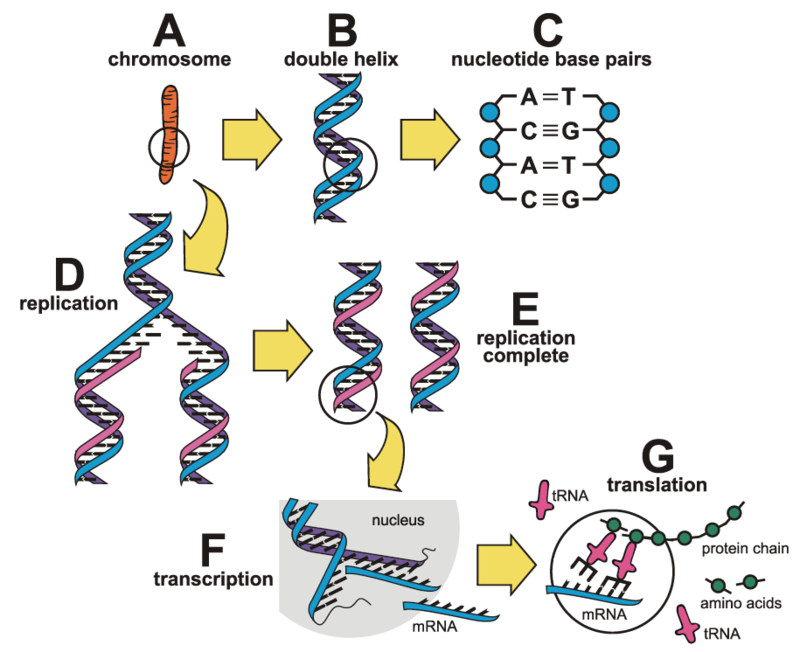 A gene is a specific sequence of nucleotide bases, and the sequences carry the information required for constructing proteins. In turn, proteins regulate the expression of the genes and provide structural components and enzymes for biochemical reactions necessary for all living organisms. The protein-coding instructions from genes are transmitted indirectly through messenger ribonucleic acid (mRNA), a transient intermediary molecule similar to a single strand of DNA. For the information within a gene to be expressed, a complementary RNA strand is produced (by a process called transcription) from the DNA template in the nucleus (Figure 1f). This mRNA is moved from the nucleus to the cellular cytoplasm, where it serves as the template for protein synthesis. The cell’s protein-synthesizing machinery then translates the genetic code, or codons, into a string of amino acids that will constitute the protein molecule (by a process called translation) encoded by the gene (Figure 1g). Following modification, the resulting protein can begin its function as an enzyme or structural or regulatory protein. Proteins are large, complex molecules made up of long chains of amino acid subunits. There are 20 different amino acids. Within a gene, each specific sequence of three DNA bases (codons) directs the cell’s protein-synthesizing machinery to add a specific amino acid. For example, the base sequence ATG codes for the amino acid methionine (any biochemistry text will have a complete list of amino acids and their corresponding codons). Thus, the genetic code is a series of codons that specify which amino acids are required to make the specific protein for which a gene codes. The genetic code is the same for all living organisms. Not all genes are expressed in all tissues. For example, the tassel and developing ears on a corn plant (Zea mays) produce pollen and embryos that will develop into seed. The differences between these two plant parts ultimately are controlled by gene expression. The differential expression of genes is controlled by its promoter. The expression of a few genes in plants is controlled by environmental factors such as sunlight, temperature and day length. These three factors are important in triggering flowering in many plant species. Genetic transformation is the area of biotechnology that has created the greatest amount of stir and is the focus from this point on. Organisms with genetic material from another organism often are referred to as genetically modified organisms or GMOs. Because all crop and domesticated animal species have been genetically modified since the dawn of time, technically they are also GMOs. When referring to organisms with a gene from another species, transgenic is a more accurate description. Many of the processes of biotechnology have been used for many years. Insulin from pigs and cows historically was used to treat diabetes and was beneficial to many. However, a consistent supply was not available, and some individuals developed adverse reactions to this type of insulin because their bodies recognized it as foreign and mounted an immune response. Human insulin produced through cloning and inserting human genes in bacteria resulted in insulin that did not cause an immune response. This was the first pharmaceutical produced through biotechnology and it has ensured a consistent, reliable source of human insulin. Before a gene is transferred to another organism, it must be identified, isolated and cloned. In the laboratory, the mRNA molecule from a gene being expressed can be isolated and used as a template to synthesize a complementary DNA (cDNA) strand. This isolated cDNA strand then can be cloned (duplicated) for transformation into another species. The cDNA strand can be used to locate the corresponding gene on a chromosome, or map it. 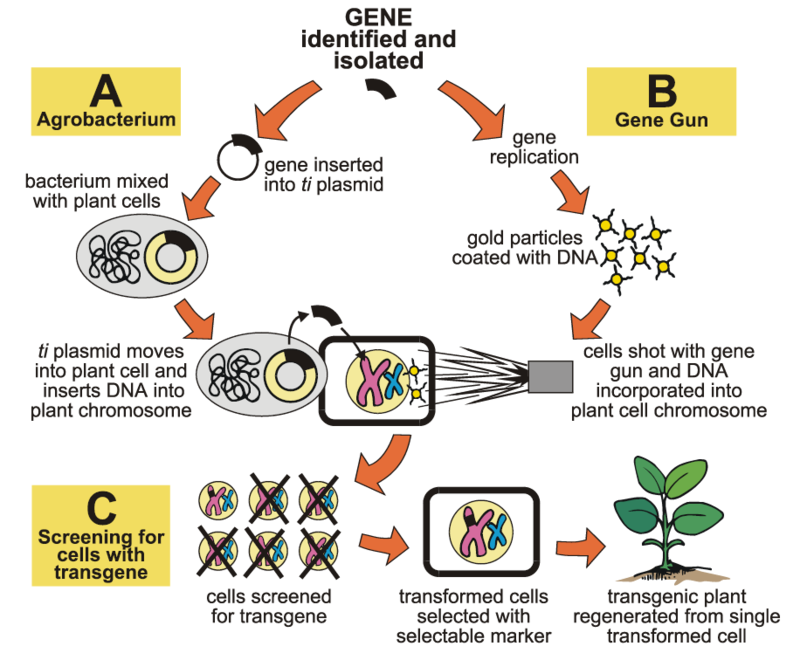 The basic process of plant transformation with Agrobacterium and the gene gun. Figure 2. The basic process of plant transformation with Agrobacterium and the gene gun. Transformation typically is accomplished by using Agrobacterium tumefaciens or particle acceleration and the gene gun (Figure 2). Agrobacterium tumefaciens is a bacteria that occurs in nature. It contains a small, circular piece of DNA called a Ti (Ti for tumor-inducing) plasmid. When this bacterium infects certain woody plant species, the Ti plasmid enters cells of the host plant. Certain regions of the Ti plasmid insert themselves into the host cell’s genome. This insertion occurs in a region of the DNA strand with a specific sequence. The host cell then expresses the gene from the bacteria, which induces massive cell growth and the resultant plant tumor for which the bacteria is named (Figure 3). Biotechnology utilizes this natural transformation process by removing the bacterial genes from the region transferred to the host genome and substituting genes of interest (Figure 2a). Agrobacterium use for transformation initially was limited to certain dicotyledonous species, but more recently it has been adapted for use with crop plants such as corn and wheat. The other transformation process involves coating gold particles with genes of interest. The gold particles are shot into single cells of the plant of interest with the gene gun. This commonly is referred to as particle acceleration. In a process not fully understood, the transgenes are incorporated into a DNA strand of the host genome (Figure 2b). This process is inefficient but does not have the host species limitation of Agrobacterium. Both processes require the use of plant tissue culture. Individual cells of the plant to be transformed are cultured. These then are subjected to the transformation process. Nontransformed cells must be eliminated. This is done with selectable marker genes. In the case of the Roundup Ready gene, Roundup (glyphosate) is used directly as the selectable marker because Roundup will kill nontransformed cells (Figure 2c). When another trait of interest is being transformed in the crop, a selectable marker such as antibiotic or herbicide resistance is used. The cells in culture are treated with the herbicide or an antibiotic. Only those cells that were transformed with the two genes will survive. Whole plants then are regenerated from the single cells that survive. Following transformation and plant regeneration, the transgenic plants must be tested in the field to ensure that the transgene functions properly. Not all transgenic plants will express the trait or gene product properly. Once a transgenic plant that expresses the trait has been identified and is stable, the trait can be bred, using conventional plant-breeding methods, into cultivars with adaptation to the environmental conditions where the crop is produced. The two most common and well-known transgenic events are for resistance to the herbicide glyphosate (Roundup) and Bacillus thuringiensis (Bt). Both of these traits are for pest management. The Flavr Savr tomato is an example of genetic modification using recombinant DNA technology designed to preserve the freshness of tomatoes. In the Flavr Savr tomato, resident DNA was modified and reinserted into the tomato. The failure of the Flavr Savr tomato has been attributed to the poor taste of the cultivar. Roundup, one of the most widely used and safest herbicides to humans and the environment, functions by inhibiting the activity of the enzyme 5-enolpyruvylshiki-mate-3-phosphate synthase (EPSPS). The EPSPS enzyme is critical in the metabolic pathway leading to development of three aromatic amino acids: phenylalanine, tyrosine and tryptophan. All plants synthesize the amino acids needed for plant growth and function. A blocked metabolic pathway that is critical for synthesis of the amino acids eliminates the plant’s ability to make required proteins and enzymes and results in plant death. A bacteria that contained an alternate form of the EPSPS enzyme, called CP4-EPSPS, that is not inhibited by glyphosate, the active ingredient in Roundup, was discovered. The difference between the two genes that code for the enzyme are slight. A single-point mutation in the gene switched the nucleotide guanine for cytosine, which causes the amino acid alanine to be substituted for glycine and prevents glyphosate from binding the enzyme, allowing the Shikimate pathway to function normally (Figure 4). Figure 4. 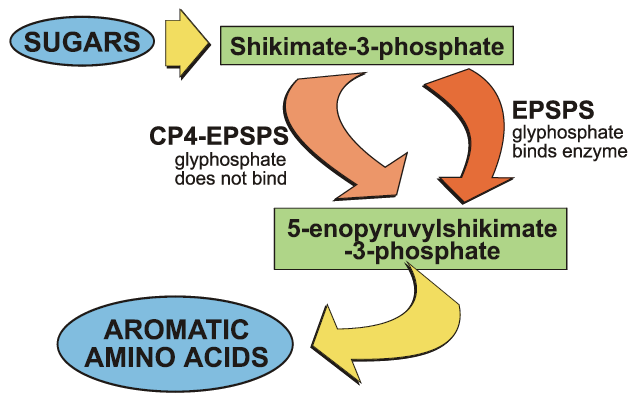 In the Shikimate pathway, glyphosate binds the EPSPS enzyme. Plants with the transgene that codes for CP4-EPSPS function normally because glyphosate does not bind the CP4-EPSPS form. The gene from the bacteria that codes for the CP4 form of EPSPS was modified by adding a promoter that is recognized by plants. This modified gene was inserted into soybean to create the Roundup Ready soybean. Because the soybean contains the CP4-EPSPS enzyme, which is not inhibited by glyphosate, the modified Roundup Ready soybean will not be killed by Roundup. This modified gene also has been used commercially with corn, cotton and canola. The Bt trait in corn, cotton and potato is another very popular transgenic trait. Bt stands for Bacillus thuringiensis, a bacterium. Research conducted years ago found that proteins from this bacteria bind to the gut of insect larva and kill them. These proteins have been isolated and used as insecticides for many years. What makes Bt crops unique is that the genes that code for these proteins were isolated from the bacteria, modified with promoters that would be recognized by plants and inserted into the crop species. The plant then makes the particular Bt protein coded for by the gene inserted into that crop. A corn hybrid with a Bt gene encodes crystaline proteins from the bacteria that are responsible for larvae toxicity. When eaten by the European corn borer, these crystaline, or Cry proteins, bind to the insects’ midgut, causing a water imbalance in the cells. The cells burst, killing the corn borer. Bt cotton, for which the target pest is the boll weevil, functions similarly. The Bt trait is unique in that multiple Bt genes are used to target different insect pests in different crops. The Bt root worm trait is another example of a specific Bt gene that targets a specific insect. As discussed earlier, not all genes are expressed in all tissues. If a promoter is used with the Bt gene inserted into a crop that is expressed in all tissue, then the trait is effective in all plant parts. For most Bt transgenic events, the CaMV35S promoter, which expresses in all tissue, including the pollen (Figure 5a), is used. When pollen from Bt corn drifts to other plants, it could result in the death of nontarget insects. Figure 5. A single Bt gene being expressed differentially in corn based on the promoter. 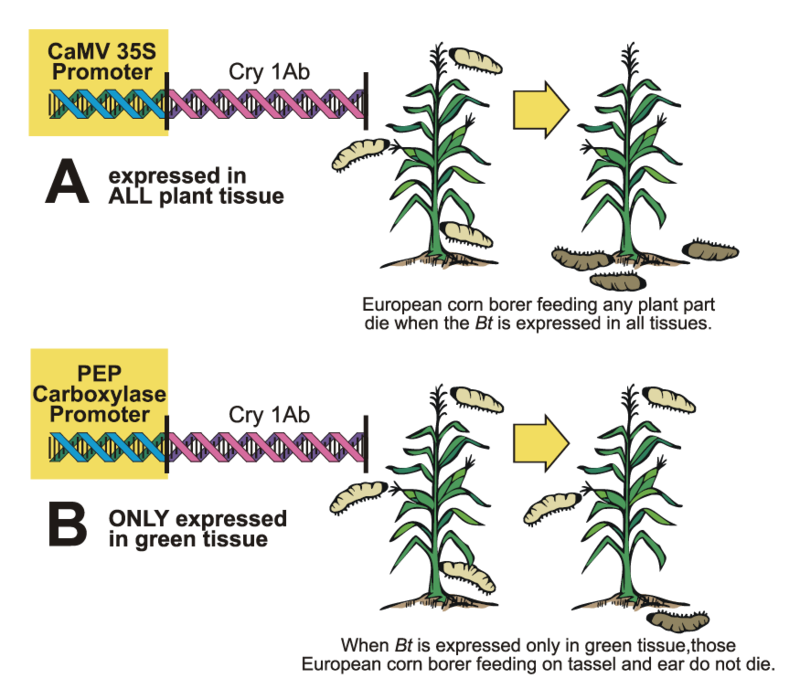 An alternate promoter sequence to the CaMV35S is the phosphoenolpyruvate (PEP) carboylase promoter from a plant gene encoding a photosynthetic enzyme. The result is that the Bt transgene with this promoter that is used to control European corn borers will produce the protein only in cells that are actively making photosynthetic proteins. Hence the root, tassel or ear tissue in this Bt corn is not expressing the Bt trait (Figure 5b). The down side of this is that insect pests that attack these tissues are not controlled; furthermore, expression also begins to slow and eventually stops toward the end of the season when the plant is completing its life cycle and photosynthesis is reduced. On the other hand, the Bt corn root worm trait is designed to be expressed in the roots. Multiple traits can be inserted into plants. Corn and cotton are examples of crops that have been developed with two or more transgenes (for example, herbicide and insect resistances). Crops with multiple traits are referred to as having stacked traits. For example, corn hybrids are marketed with eight different traits. Transgenic crops, and biotechnology in general, have tremendous potential to benefit producers, processors and consumers. The examples used here are mostly limited to those that aid the producer who grows the crop. As advances in biotechnology are made, learning about and understanding the technology is important to avoid confusion and misinformation that could prevent the potential benefits of the technology from being realized. This publication was authored by Michael D. Peel, former Extension Service agronomist, NDSU, 2001.